After director Sam Raimi and his creative team were taking too long to make Spider-Man 4 happen, Sony decided to call it a trilogy and reboot. The Amazing Spider-Man arrived five years after Spider-Man 3 and the consensus seemed to be it was too soon. Now, just three summers after The Amazing Spider-Man 2 put an end to that incarnation, we get another reboot in Spider-Man: Homecoming. You might think the prevailing sentiment would again be "too soon", but this new beginning is different in several ways. Most significantly, Sony worked out a deal with Marvel Studios to make Spider-Man part of the Marvel Cinematic Universe. You already know this if you saw Captain America: Civil War, 2016's hero-packed outing that felt more like a third Avengers movie than the third chapter in Captain America's standalone series. The new Spider-Man was introduced in that film as a young teenager who was very excited and nervous to be recruited by Iron Man to partake in the big Berlin airport battle between the two clashing factions of good guys. That sequence was the highlight of the film and Spider-Man was the scene stealer, earning big laughs with his unfiltered enthusiasm and inexperienced banter. 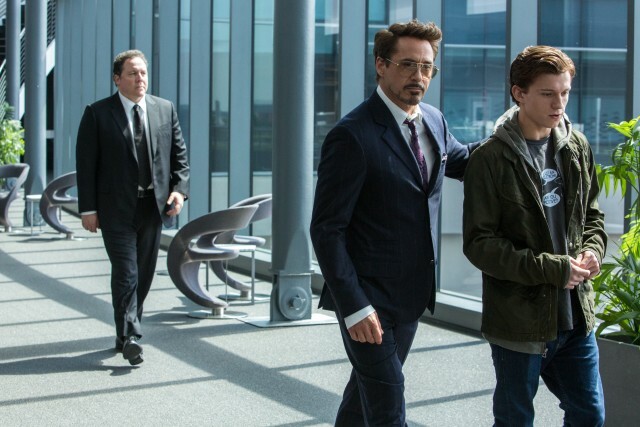 That widely-seen blockbuster has to be considered the most effective marketing to date for Homecoming, which now gives us an entire movie with that socially awkward, 15-year-old Peter Parker (Tom Holland) and his web-slinging alter ego in the foreground. We open in the aftermath of 2012's original The Avengers, which saw the heroes team up to save New York from menacing aliens. 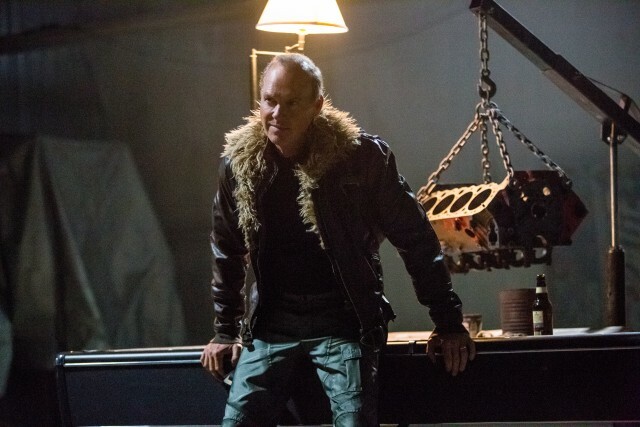 Among those contracted to clean up the otherworldly destruction is Adrian Toomes (Michael Keaton), who is none too pleased to have federal agents take over the job from his crew. Toomes and his men keep a little bit of the found alien technology for themselves and use it to make powerful weapons they sell on the black market. But this movie doesn't belong to them. It belongs to Spider-Man, whose experiences in Civil War are reframed as a first-person documentary short early on. The excitement of the Berlin battle has Spider-Man eager to hear from Tony Stark/Iron Man (Robert Downey Jr., not ready to give up this character) and his assistant Happy Hogan (Jon Favreau). But while his texts and calls go unanswered, Peter Parker patrols Queens in the high-tech suit that Stark gave him, thwarting bicycle thieves and a man trying to jimmy his way into his own locked car alike. sophomore year at his midtown high school, where he's a valued member of the academic decathlon team. Peter's guardian, Aunt May (Marisa Tomei), is under the impression that he's gone all the time as part of an internship with Stark Industries. But his best friend, the chubby, nerdy Ned (Jacob Batalon) learns his big secret and has tons of questions. 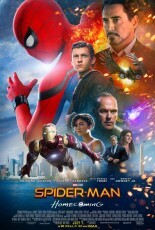 On the night when he's attempting to have his "friend" Spider-Man make an appearance at the house party thrown by his crush, Liz (Laura Harrier), an attractive senior and fellow academic decathlete, Peter instead gets drawn away to a weapons deal by Toomes' associates. That puts him in the thick of their black market operation, throwing him into danger and bringing Iron Man onto the scene to save the day when young Peter cannot. The subtitle refers to the Homecoming dance that Peter asks Liz to. This follows the decathlon team's trip to Washington, D.C., where chaos pulls Peter away from the academic questions. Homecoming is directed by Jon Watts, a young filmmaker with two features (Cop Car, Clown) and a couple of The Onion television series to his name. Watts is even less of a known property than James Gunn was prior to being entrusted with Guardians of the Galaxy and that doesn't appear to be by accident. Watts seems like an ideal Marvel directing candidate: fresh, hungry, and needing to prove himself. Though he certainly isn't going to sell tickets on his name, he also was not going to need to be replaced over creative differences like Edgar Wright was on Ant-Man or The Lego Movie directors recently were on the Han Solo prequel. Watts, who is also one of six credited screenwriters, does his part to ensure that this Spider-Man doesn't feel like a retread of either the Raimi/Tobey Maguire trilogy or the Marc Webb/Andrew Garfield pair. Spider-Man and Aunt May are the only two characters obviously reprised from those other versions and, cast significantly younger than before, they feel fresh and different. Making his sixth feature appearance as Iron Man in nine years, Downey ought to be wearing out his welcome, but that character remains easy to watch and here we see him in a new light as he assumes a father figure role in Peter's life. Beyond Tony and the aforementioned Happy (who gets to make use of Favreau's comic relief skills), the only other personalities carried over from the MCU are Captain America (Chris Evans), making four clever cameos in pre-taped videos shown to students at Peter's high school and Marvel's funniest post-credits tag to date, and Pepper Potts (Gwyneth Paltrow), appearing briefly near the film's end. That prevents this from feeling like yet another Avengers movie. Holland's youth allows this version to give us a more believable depiction of high school than either Maguire or Garfield did (both were in their late 20s when cast). There's a little bit of a John Hughes feel, complete with a Ferris Bueller's Day Off homage that is direct about acknowledging its source. This Spider-Man is also more multicultural than past incarnations. Rival student Flash Thompson is played by The Grand Budapest Hotel's Lobby Boy, Tony Revolori (who is of Guatemalan descent). Playing best friend Ned is Batalon, a Filipino-American actor. Love interest Liz is biracial and so is Michelle (Zendaya), an offbeat classmate who is revealed to be a key cog moving forward. That so many different groups can be represented without a feel of calculated progressiveness is impressive, but you might just be too invested in the story to even notice. his Vulture feeling like a distortion of his Birdman alter ego, which itself leaned on the fact that he played Batman for Tim Burton most recently a quarter-century ago. Keaton's presence gives weight that very few other actors could. This is not your typical Marvel villain. The standout scene isn't any mayhem or action but an uncomfortable car ride that lingers on Keaton's face as he puts some puzzle pieces together. Homecoming lays groundwork for this Spider-Man to stick around longer than either Maguire or Garfield did. That seems to be part of the reason why Holland, who just turned 21 this month, was cast at his age. I expect reviews to be favorable, so the real test for Homecoming will be the box office numbers. Since The Avengers, no film featuring Downey as Iron Man has grossed less than $400 million domestic and $1 billion worldwide. Ignoring inflation, those numbers are higher than all five previous Spider-Man movies have reached (the first one did surpass $400 M domestic back in 2002) and perhaps more than this film can realistically anticipate. But Iron Man's presence, coupled with good reviews and the good will held toward Civil War, suggest an increase, so long as moviegoers can resist the fatigue that comes from this opening a month after DC's Wonder Woman, two after Guardians of the Galaxy Vol. 2, and four after Fox's Logan. All four of these movies offer distinct pleasures and halfway through the year, all rank among 2017's best films. But we are at the point where "too many superhero movies" seems like a growing sentiment that could spread. Text copyright 2017 DVDizzy.com. Images copyright 2017 Sony, Columbia Pictures, Marvel Studios, and Pascal Pictures.